Find hotel near Eglise Saint-patrice De B ..
Several architectural styles combined together to make this magnificent structure famous as the Eglise Saint-Patrice de Bayeux cathedral. Built in the 11th century, the cathedral stands erect in the heart of the city with plenty of hotels and attractions surrounding it. The interiors of the church are impressive while its nave is popular among music lovers. The highlight of the church is the spectacular bell tower that classifies as an interesting specimen of Renaissance architecture. Entry to the church may be free. The timings of the church aren’t available. How popular is Eglise Saint-patrice De Bayeux? 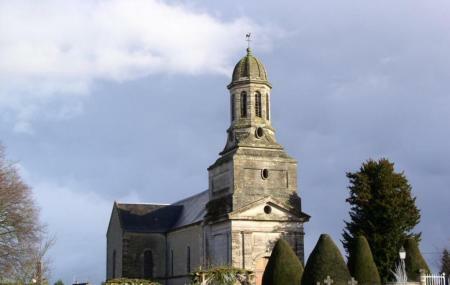 People normally club together Reporters Memorial and Atelier Galerie Ludovic Grand-guillot while planning their visit to Eglise Saint-patrice De Bayeux. Beautiful cathedral that you are free to tour. Regardless of you religious belief or lack of you will be able to find a quiet spot to reflect as I did. The cathedral has been built and rebuilt throughout the years with the crypt being from the 11th century. Take your time here. Sit, enjoy the art, and the people milling about as you embrace so many centuries of history and hope.